Now that you've caught your fish, it's time to break out the fishing knives. Use your knives to quickly and easily clean, scale and fillet your catch for a fresh supper over the campfire. Knives come in a wide price range. Depending on your needs, you may be able to get by with an inexpensive knife, or you may prefer to spend a bit more. Either way, be sure and get a knife that will do what you need it to do. For under $20, you have quite a choice of decent knives. 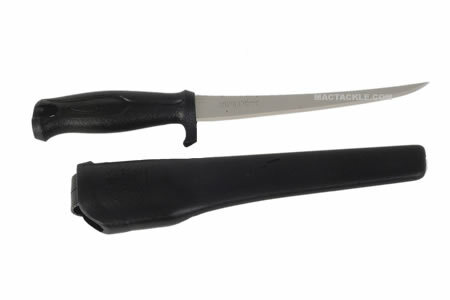 A small fillet knife may be all you need, and you can find several in this price range. Look for surgical steel blades that will keep their edge for a long time. Some of these knives come with a sheath that has a built-in ceramic knife sharpener. Some even have a handle made with an inner core of glass-filled polypropylene through a process that bonds the two materials into one. This makes a handle that is soft and tacky when you hold it, giving you a firm grip. Other serviceable knives in this price range offer full tang blades with enough flex to create a perfect fillet. Also in this price range is the traditional bird and trout knife. This classic features a short slim blade, and an attached skeletonized handle for versatility and ease of movement. While it looks a bit strange, once you've used one, you won't know what you did without it. A large ring on the handle end makes it easy to hang from your finger when not in use. Most of these models include a sheath and a lanyard. For under $50, you can find the bear claw style of knife. It is perfect for almost any use, This style features an easy to grip handle, and a hole for your finger. Another popular fishing knife modeled is after a traditional Scottish knife called a Skean Dhu, or Black Knife. This is a compact, multi-purpose knife. It has a thin needle-like tip for piercing, and is easily controlled for filleting, or other tasks. If you think you need more than one knife, think about the type that allows you to trade blades. With a single handle, you can have a cook's knife, a fillet knife, a saw blade, a carving blade, a bread knife, and a paring knife… all in one! The blades are made of stainless steel and come in a portable case. For under $100, you can get the professional curved blade used on commercial fishing boats. If you fly fish in salt water or go for the larger freshwater fish, this may prove helpful for you. The curved blade holds whatever you're cutting up against the blade for efficiency. When not in use, the locking blade folds inward, protecting the blade inside the handle. 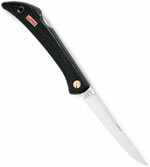 Another fine knife features a wide, stainless steel blade in a molded handle with soft rubber inserts for a solid grip. The sharp blade is smooth at the tip and serrated towards the handle. A similar model offers a folding blade for easy storage. 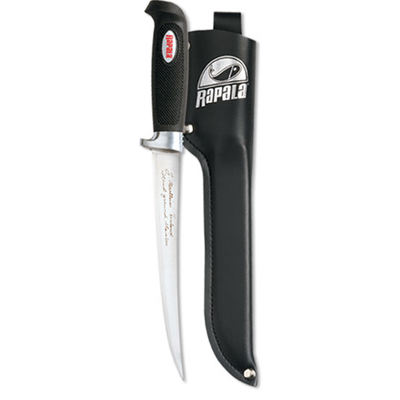 Another classic model in this price range is a standard hunting knife. The straight, fixed blade is perfect for fishing and camping use. The handle is made of beautifully polished cocobolo hard wood with a brass tip. This knife comes with a brown leather sheath to protect the blade when not in use. As you can see, there are plenty of fishing knives to help you on your fishing trip. This is a tool that you should have when you are out in the wilderness, as it can help you clean your fish as easily as it can cut up small branches for a campfire. An angler's fishing knives should never be far away… you'll see how useful they can be.